Here is some information to help you get started managing your grant searches and alerts. 1. The grant search form is on the home page. You'll automatically land there after you log in to your account. You can run a search for available grants using state, county, program areas and keywords. Do NOT use more than one or two keywords per search, otherwise you will block all grant results. 2. If you like your search results, you can name and save this search by clicking the "Save Search" button. You can save as many searches as you like. 3. To manage email alerts for your saved searches, click "Saved Search". You will see this just above the County field (see graphic below). 4. Your list of saved searches will appear. A star is shown next to each of those searches. If the star is an outline only, you are not subscribed to email alerts for that search. If the star is solid, you are subscribed to email alerts for that search. 5. You can change your alerts by clicking on the star next to each search. For example, if the star next to the search is an outline only and you click the star, it will become solid - indicating you have subscribed to email alerts matching those search parameters. 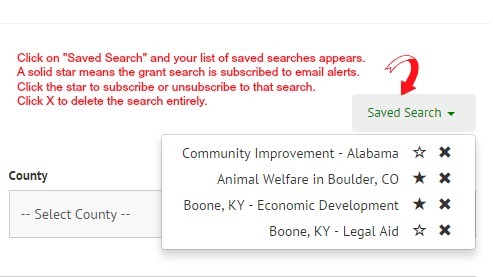 Now that you have set up your saved searches, you should receive email alerts any time a grant matching your search is added to/updated in the database. Please be sure to add rjunell@grantgopher.com and grant@grantgopher.com to your list of accepted email senders. We can't deliver your grant alerts if your email account blocks our email addresses. We are committed to providing you with the best, most comprehensive and up-to-date available grant information in the country! If you have questions about anything or suggestions for making the service even better, feel free to contact us using the "Contact Customer Care" button on the bottom right hand side of the website.